I was delighted when Nordstrom asked me to put together a series of Fall outfits using items from their Anniversary Sale – after all this is my favourite sale of the year. So I’m kicking off the series with an outfit formula that incorporates some of my own sale purchases. Later this week, you’ll see a few of my clients rock Fall outfit formulas their way. The unstructured trend is as big as the structured trend, which feels fashionably liberating don’t you think? I love tailored items but loosey-goosey looks are just as close to my heart because voluminous silhouettes scream playful fun. So it makes sense that the outfit combinations that I fancy most at the moment are the ones that pair structure with flowing volume. The effect feels MODERN. I like to call these types of outfits “Semi-Structured”. You’ll need a structured pair of trousers with tapered or straight leg hems. A slight bootcut will also work. Nothing too tight or flared. Add a voluminous top, like a big tee, soft boxy blouse, a high-low knitted top or pullover. The tapered trousers provide the structure for the unstructured top, creating a comfortable match made in heaven. Only Mine’s Zip Back Wool & Cashmere Sweater (1) is my first high-low hemmed top and I’m smitten. It’s that dropped shoulder seam with a narrow sleeve that sealed the deal because I find it more flattering than a dolman sleeve. The back zipper, rich purple hue and non-itchy wool were further great selling points. The high-low hemline is a vitally important structure building tool because it exposes the structured trousers. Cover them up and the outfit is less polished and chic. The same can be achieved with straight hemmed voluminous tops by semi-tucking the fronts. Theory’s Yanette Copnehagen Pants (2) are structured and a tighter fit on the model then they are on me. That’s because I like a looser trouser fit, and longer hems that create a slouch in the leg line. Although I personally prefer full length tapered trousers that scrunch at the hem, this is not a prerequisite for the look. By all means keep the silhouette more streamlined and shorter like in the photo. 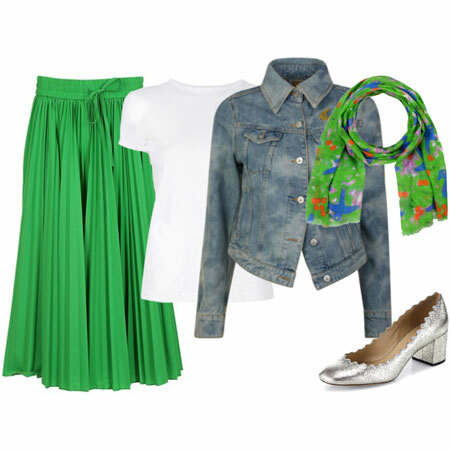 Leave the ensemble just like that, or add a scarf, necklace or other jewelry for more interest. I’ve added the grey Halogen Fitzgerald Challis Scarf (3) because I like purple matched with green. Add footwear like pumps, shooties, loafers, peep-toes or booties. I’ve chosen Sam Edelman’s Petty Python Bootie (4) because it bookends the colour of my blonde hair, adds outfit texture, and is my favourite heel height. I’m going to be wearing these little booties with an assortment of trouser and jeans styles this season. As with all the formulas, I sow the seed of an idea. The next step is to substitute the items that are more to your taste. 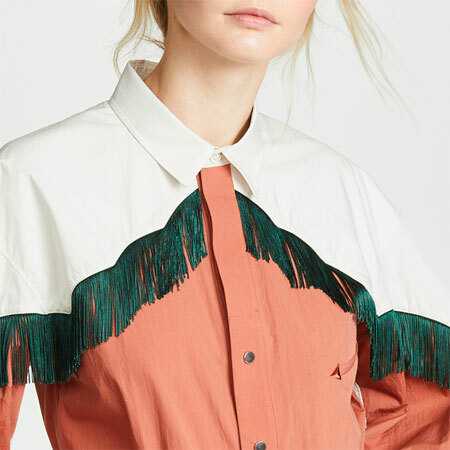 Perhaps you’ll wear patterned trousers with a semi-tucked boxy silk blouse. Or straight leg cigarette trousers with a high-low t-shirt. Or peep-toe booties and a bib necklace. The semi–structured trouser look could work in an office environment when the items are fairly dressy, and on days when a structured jacket is not required. Or you could wear the look when you’ve had your fill of jeans, which is where I’ve been heading for a while. what fab colors. And I like how you show us how to wear the unstructured top look with flair this season. Structure on thebottom+ loose on top+ add texture/interest= fall winner! Cannot wait to try this formula! I always love seeing your formulas, Angie. Inspiring! I always like the flowy tops. I’m glad they’re back. Yes, sick of jeans! Absolutely beautiful! I really like this look as it is ageless and I think a more thickly built woman like myself can rock it as well. Thanks Angie this is a great idea for a fall look that I think I can pull off. These Theory trousers are just gorgeous, I love the colour and fabric and LOVE how they look on you: timeless and modern at the same time. I adore this ensemble, spunky, happy and playfully elegant. Wow, this is uber-fantastic. So simple. Thank you Angie for putting the NAS items into practice. It’s inspiring and useful. Love the satisfied over-the-shoulder glance. Somewhat unrelated, is there a PPL for shirts withnpantsL. I know the blog at one point covered how skirt shirts should be shorter than pant shirts but with tucking and hi- low hems on trend, does that matter anymore? Purple is one of my favorite hues, and seeing it given a minimalist/modern flair is terrifically fresh. I’m thinking that a pair of trousers like these could update some of the purple I’ve already got in my wardrobe. I’m anticipating a long hunt, however. Many YLFers are sizing up to get this look, and, when you begin as a 12/14, this can be difficult to pull off. I’ve even tried raiding the plus department, with no luck — the cuts are different there and end up being too wide in waist (and not just a little) and too short. Wish me luck! And you look amazing! You know I love the combo of structured and slouchy. 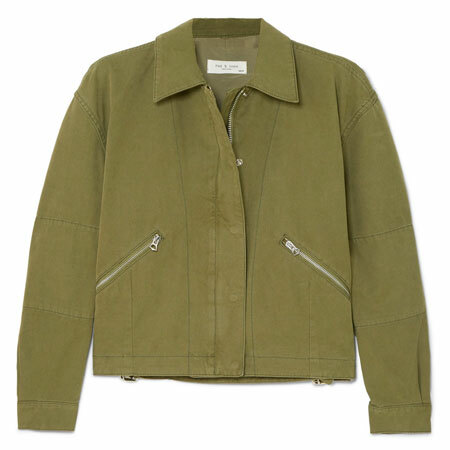 I particularly like how this is slouchy and relaxed yet remains sleek. Wish I could try this but my one lone pair of trousers will not work. Love love love this outfit on you Angie! And so glad you discussed the pant length – I find this aspect of styling very confusing. So stylish! and thanks for sowing the seeds of an idea. Although, we dont have Nordstorm here in Canada, it is great to see what is available there and how I can play with different items. I will be really busy next two months with my exams and some family visiting. I can’t wait however, to be more active on the forum. You look so amazing here Angie! I love those trousers on you. The zip detail on the sweater looks especially good with the scarf print, which makes a great collar for your graceful neck. Lovely! OMG ! I LOVE this whole outfit. I don’t know who to thank…Angie or Nordstrom. I particularly like the yellow with the purple/fuchia. That is such an unexpected and surprising combo for me. Those pants are to die for but they are already sold out. I just received this sweater in teal (so happy, my favorite color to wear because it makes my eyes totally stand out!) and I can’t wait for fall weather to wear it. This gave me some great ideas for styling it. I’m tickled pink that you were able to find a wool sweater that doesn’t itch, as I remember that your skin is sensitive to wool, AND a cute pair of low, comfortable booties. Hooray! I forgot, I had a question for you as well. I LOVE wearing my scarves in a faux-infinity scarf or cowl style, but I have a difficult time getting them to stay in place without a brooch or safety pin. Yours looks quite neat and secure (and I love how it kind of functions like an oversized collar.) What’s your method to styling and securing a scarf in the way that you do here? That sweater is divine on you, love!! I just love this outfit! I wish that sweater would work for me. It really is a lovely color, and that zipper down the back is so unique. And those trousers are to die for! Perhaps they will be available a little later on. You look spectacular, and I’m looking forward to the next installment! This is just fantastic! 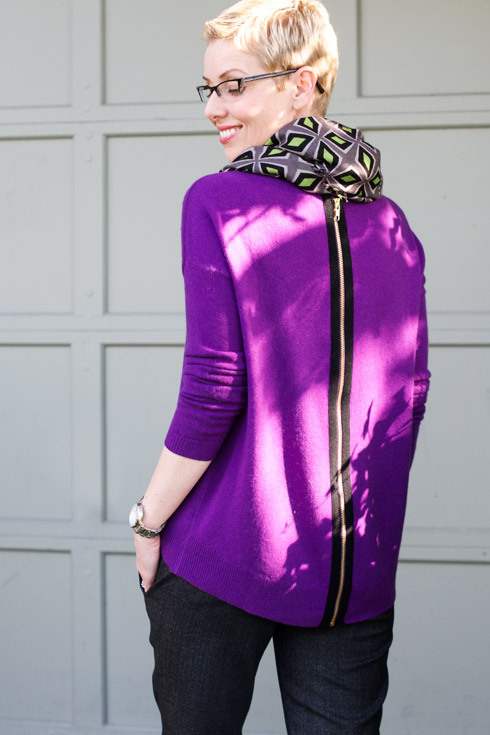 Unfortunately the purple sweater is gone, but I just nipped over and ordered that fab scarf!! Thanks for the kind words! I’m thrilled that this formula is resonating. It’s a trouser season. Colour and pattern are still holding strong. 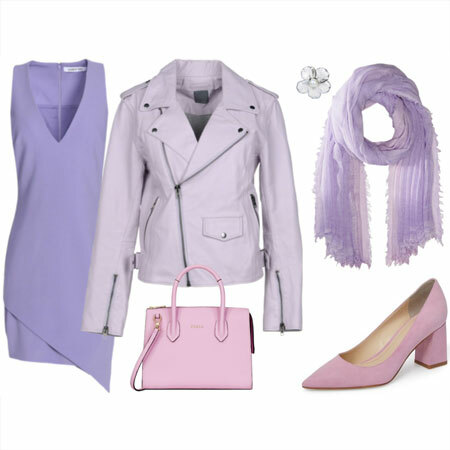 This outfit combination can incorporate many trends that work in harmony together. Melllllls, those guidelines absolutely still apply. But they can be bent in ways that still create attractive proportions. A topic for another day! Adrienne, this formula is NOT restricted to body type at all. Thanks for pointing that out. Beth Ann, I wonder whether you can purchase a pair of trousers that fit close enough and have them altered so that they fit exactly how they should. It might be worth the investment. Kari, you are so sweet. Thank you! You remember an amazing amount of detail and *I am* tickled pink! I wish I could share my so called scarf secret – but I really don’t have one. I guess I don’t have hair that shifts them around, and perhaps my giraffe neck acts as a supporting foundation. Last but not least, the reason I’m wide mouthed in the one photo at the end of the post is because I spotted Rosie in the window just across the road looking at us taking these photos in front of our neigbours garage. Priceless. You look beautiful in purple. I love the trousers (I will always be primarily a trousers girl) and the scarf is fab. The booties are also very cute and I have been eyeing them in some of the other color and pattern combos. This has been a great tutorial as usual! Haven’t liked jeans in a long while – this outfit is fabulous is so many ways, the color, the structure play of the trousers with the softer sweater and that wonderful exposed zipper. I also like that you can wear it with or without the scarf and still be finished and composed. Great! Wow Angie! You carry this look off so well. I love the rich purple on you and the slightly loose fit of the trousers. Now I want to look for a pair of slim, flat front trousers too. 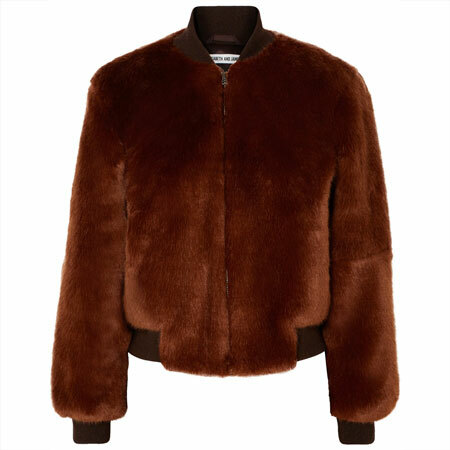 A little wary of the oversized trend though, does it work on larger busted women? I have been eyeing those theory pants. They look very different between the picture on the model and your outfit. Beautiful in both, though. I also love that sweater. Like, you I’m all over the unscrutctured look theses days. However, I love dolman sleeves. I think I would like this sweater even more if it had them. I love this rich mixture of purple and grey and the photo of the back zipper, with you looking over your left shoulder, shows all the gorgeous reasons why you bought these NAS items. Next favorite is your MOTG look of love, joy and recognition to Rosie. Angie, this is one of my favorite looks of yours! I love the details and the silhouette! Kirti, you might need a lower neckline and a drapier fabric. A full busted gal can definitely wear this look. I adore this outfit. The sweater looks soooo much better on you than the model! May I ask, you have so many lovely trousers on your NAS Picks list this year…are there any that are suited for me or for MOTGs in general? There are occasions where I want to ditch the denim, but dresses are too much. A lovely pair of understated trousers is just the thing, but I’m not sure which of your picks would work best for me. Would love your thoughts! 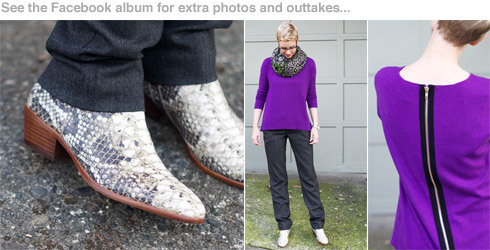 I’m also sooo excited about this series of outfit posts from NAS picks! Great outfit. I love that sweater. Purple and zippers make me happy. This outfit looks so fantastic on you, Angie. I love your *formulas* and your encouragement to use items that make the formula our own. Angie, this is just PERFECT in every way. It’s so deceptively simple, but the devil is in the details, so to speak – the juxtaposition of textures, the lovely drape of both the sweater and the trousers, the perfect fit of the trousers, the bookending shoes, the gorgeous scarf. I absolutely love it. What a lovely suprise! A post from you on the weekend! Loved waking up to this Sunday morning. Well Angie I just LOVE this look on you. That color is so vibrant and looks beautiful on you. This look resonates with me so much and I actually have a very similar sweater top in green with a shorter exposed zip. I normally wear it over skinny leg jeans and boots but I am going to try out your formula tomorrow as I have a quiet day in the office. It’s a comfy and cosy look but still elegant and put together. Thank you sir the well needed inspiration today. Deborah asked the exact question on my mind – would this also work with a pencil skirt as the more structure bottom half? This outfit is stunning on you Angie – love the rich purple colour and how your trousers have a slight slouchy look to them with the scrunched ankles. I don’t remember ever seeing you in a scarf this way before – it’s lovely. I assume this sweater in particular would be too long in the back for a shortie like me? I’m really looking forward to seeing all of the outfits in this series – what a fabulous idea! Oh Angie, this is just gorgeous. I”m so in love with that sweater and i, too, am a fan of purple + green. I love the way you are wearing the scarf and that pant shape loves you right back. Ha! I just checked the website and the pants are “currently unavailable.” Way to go, Angie. I have total trouser envy. I had a pair similar to these many years ago and loved them. I’m still trying to NOT order those python booties, but they are gorgeous. What a great outfit that lends itself to many translation possibilities. Deborah and Shannon, sure this type of pullover will work with a pencil skirt! Personally, I’d pair it with a midi pencil skirt and slipper flats. Shannon, this pullover actually worked quite well on petites. I was surprised when some of my petite clients tried it on. It’s not THAT long at the back. Angie, could you possibly be anymore adorable? I love the color, the simplicity, and the individuality that you exemplify. Perfect! Fab – say something like the Vince Camuto tube midi skirt in black??? Suddenly both this sweater in teal and that skirt in black have found their way onto my wish list. This outfit is stunning on you, Angie. Since you run cold, I’m so glad that you found a wool/cashmere that your skin will tolerate. Oh, Angie, you are my fashion fairy godmother! I adore both all three pairs you suggest for a dressier (but still casual!) MOTG look. I was reminded by the first pair that I actually own a pair of AT black ponte knit straight leg pants that need hemming, but have a similar look to the (I’m sure gorgeous) wool Lafayette straight legs. The two Halogen pairs are a great price point. 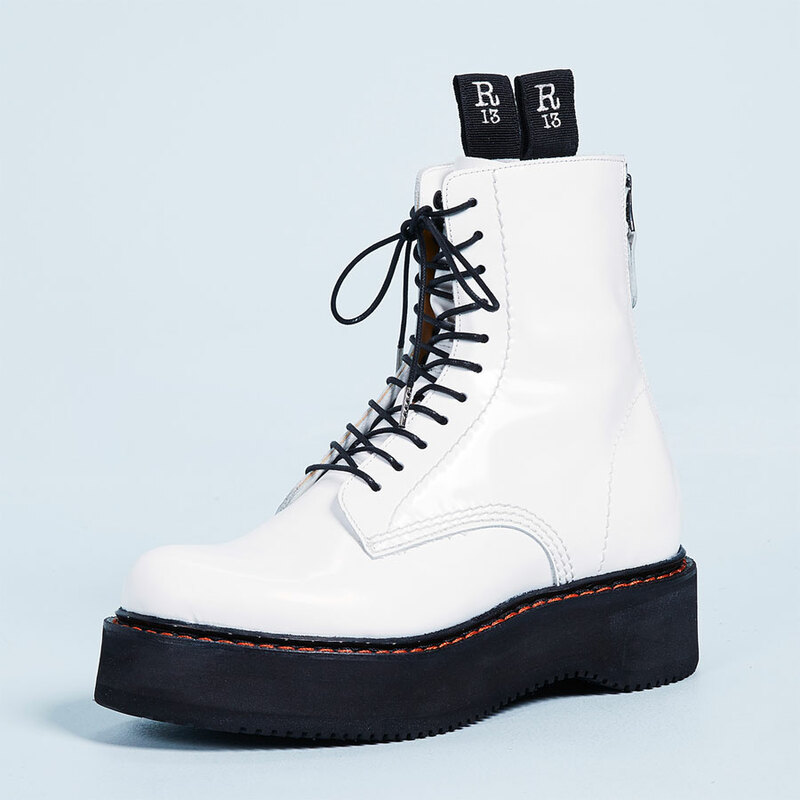 I might take the plunge on the first black/white wide leg if you think they’d work with my black/white leather Cons. Love, Love, Love this!! Angie, you look better in these clothes than any of the Nordstrom online models. I was looking at this sweater online (haven’t actually been in yet…many reasons including, I can not motivate my clients to shop NAS even though the prices are good. They’re willing to wait and spend more.) I thought the neckline would be too high for me, (inverted triangle) but after seeing it on you, I can see the neckline is delicate and it will work with a long pendant necklace for me. I am also glad to hear it’s not itchy. I also love the trousers. Angie, might I suggest you consider having the legs taken in a bit. I know you love slouchy and you look fantastic, but you’d also look fabulous with a slimmer leg. Lastly, thanks also for the scarf inspiration. I love purple and green together also! I probably wouldn’t wear the scarf with the sweater only b/c of what I mentioned above, but I love how you styled the scarf…doesn’t compete with the zipper at all. Thanks again!! I’m glad that you like the suggestions, Mamapicklejuice :). I think you would look smashing those trousers and Converse sneakers. Shannon, perhaps your new black midi will work. I noticed in the reviews that two comments indicated the sweater runs large. Did you find that? Swooning, swooning–can’t wait for the rest of this series! love the scarf most! and the top – it`s like a play on the short front-long back/semi-tuck look. loving the overall look, can`t wait to look for and add similar items to my wardrobe! Angie, you look wonderful! That purple is absolutely fantastic on you. And I love the carefully coordinated details of this (though I bet you find them a breeze to put together, they look like they’ve been *planned* to the least minutae) — like the way the black and white lines in the scarf ‘continue’ into the shiny white zipper in its black ribbon, and the way the diamond pattern echoes the snakeskin on the boots! Also, looking at you, I just realized I may not need to hem my new charcoal pants (still awaiting a length alteration) at all, if I’m okay with the slouchy styling! Whew! Just when I was itching to try them out to work, but NOT wearing them for fear of a PPL faux pas. Thanks for the advanced class in PPL, and ‘permission to slouch’! I love the slim, but not skinny-tight pants: versatile, comfortable, and flattering. Great pick! I’m a sewist, so I was wondering if you could measure the hem circumference so I could get an idea how to translate this look to a pattern? Thanks! And I can’t wait to see any additional NAS looks. And Hie to Angie and all fabbers. I think I am back now in the site again after finishing my fiscal year end and reportings etc. Shannon, this pullover runs TTS in my book. Not at all large. Fashionista, nice to have you back. Kathleen, the hem circumference is 13.5 inches. Thanks for posting the extra Facebook photos, Angie. I just fell in love with this look all over again:-) The slouchy yet still dressy silhouette of the trousers is very much my cup of tea, and it works so well with the low-high hemline of that gorgeous sweater. This was one of the looks I had in mind for Autumn-Winter, can’t wait to start sporting my own version. Also: I had a feeling Princess Rosie was in your line of vision in the second but last picture. So cute!! Angie, you look great in this outfit! It’s rare to see you in a knit top instead of a woven one, and I wonder why not- you wear it so well! That purple is fantastic on you. I’ve been dying to find some pants with that silhouette, so I’m so sad those are sold out. If you happen to run across any that are similar would you keep us posted? And of course I adore those booties. I hope this brunette can make them work even though they seem to be a natural for blondes. I’m eager to see more of your NAS outfits. Angie, in one of your replies, you mention that you have some sleek cigarette trousers. I’ve seen photos of cigarette trousers and am interested in those as well as the Theory ones featured here. But what is the difference between the 2 cuts or leg lines? Some of the photos I’ve seen don’t look too different from the Nordstrom photo of the Theory trousers. This is a great outfit Angie! LOVE the sweater. I’m sad to see that color not available anymore ;-(. I’m determined to hammer down a good pullover capsule this year. I always find myself freezing mid-January and frantically searching for pullovers to keep me warm. That’s a good idea, Queen Mum. The purple colour was most popular in this pullover it seems. Ah! Parsely, I wear knitwear (and woven tops) all the time – I don’t wear knitted tops (tops made of jersey fabric). This top is *knitwear* – what you would call a sweater. Hope that makes sense. Jamie, cigarette pants are snug straight up and down, like the model in the pants, or even tighter than that. Some like them to scrunch at the hems, while others don’t. I like a bit of scrunch! Oooh this is a wonderful formula! One of my favorite ways to wear hi-low hems (though I do find semi-tucking some sweaters tricky, even when the knit is a finer gauge). The color of this sweater is just gorgeous; I want to replace my own purple cashmere sweater who’s seen better days this year, and had hoped this would be the one to do so but couldn’t find it in my size. I will keep my eyes open in case it comes back into stock, I just love it so much! Quick question! Would this type of loose/boxy hi-low top work over pleated slouchy trousers, do we have to do something special to make that work? Fabulous! I absolutely LOVE this silhouette, and you look so beautiful and vivacious in the purple. The boxy sweater is just perfect with those gorgeous trousers–love the slouchiness and the mix of textures. 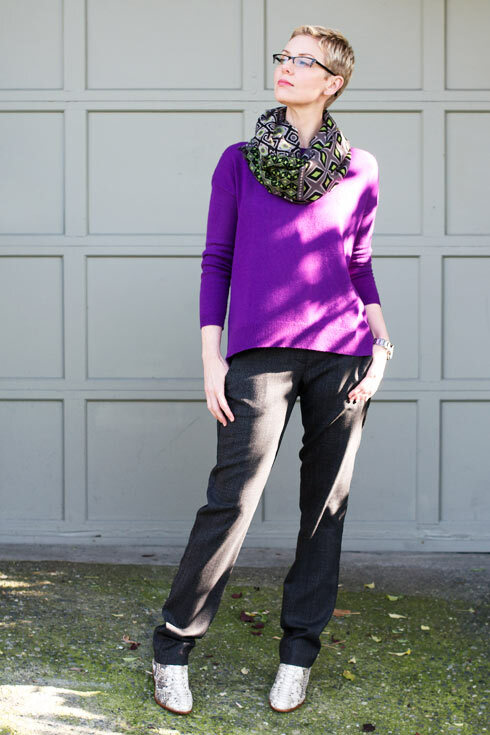 The scarf and booties add personality and help make the look distinctive (says a member of Team Pattern!). You would never know that you are absolutely exhausted from NAS by looking at these pictures :). I’m looking forward to the rest of the week–what a great series, and you have kicked it off with style and verve! I’m looking forward to seeing the rest of this series. Very inspiring! WOW!!!!! Angie, You truly DO Look Fab! I love that outfit, and it’s so versatile, it could go almost anywhere. So very chic, it nevertheless looks relaxed and comfy! I have to confess, I’d never heard of Copenhagen trousers, but if that’s what these are, then I’m in love with them. AND what a great sweater. A gorgeous zingy colour, and I just love the zip-fastener at the back! Had to stop by to say how brilliant the whole ensemble is, and just love the touch of snakeskin. You certainly know your job!!!! Which reminds me, I have to get back to mine, ( this is my lunch-break), ‘cos I have a full theatre-list this afternoon. I somehow don’t think my colleagues would forgive my starting my ops. late if I admitted it was cos I got held up on You Look Fab! I adore this outfit! And I just ordered that jumper in the grey color after seeing you model it Angie. I picked up the Tarnish blocks of color scarf in blue multi at NAS this weekend and can’t wait to wear the two items together. Thanks for the outfit idea! What an interesting and bold outfit! I would have never thought to wear those pieces together but everything looks fab! You are a NAS genius. Just saw this – SO fun to have the loose and structured items paired up. The purple is lovely on you, and I am taking notes for my purple trench! I love this combination. I’d definitely try this sweater if I was closer to a store. I LOVE the zipper down the back and that it’s slouchy! The python booties are perfect, too, of course. What a beautful outfit. 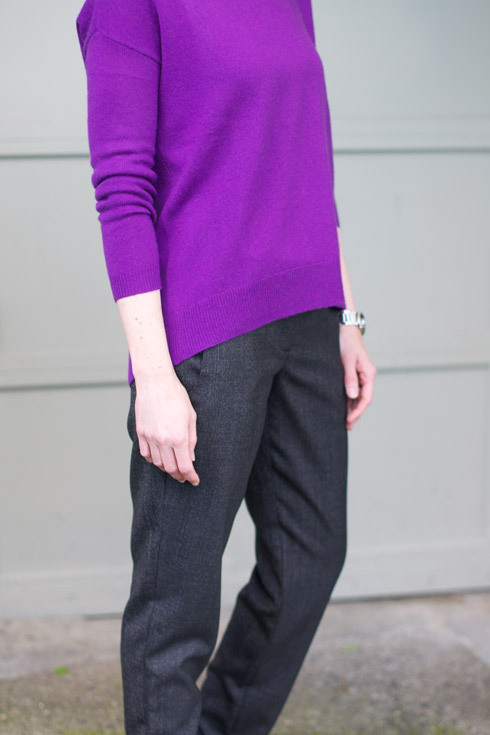 Love the purple sweater, oh my – the hem, the color, the zipper (!!!) and dig the scarf over it. The pants look fantastic; not sure how I feel about the scrunching at the bottom, I myself would probably prefer a regular length, but I do enjoy how you pull it off. And the booties, well, I’m still anxiously awaiting mine in the mail They are the cherry on top, of course. I returned a sweater I really like last winter due to the exposed zipper on the outside of the garment, is this going to be a new trend? I am really trying to understand how this looks polished and well, it just does not make sense to me. At least right now. Thanks for the very kind words, ladies. Antje, thanks for appreciating my slouchier trousers :). I’m excited for your booties to arrive on your doorstep! Tonya, exposed back zippers are not all that new – they’ve been around for a few seasons, and are still going strong. What was it about the exposed zipper that made you return the garment last Winter? I’m curious as a kitten. La Francaise, you crack me up. Lisa, your scarf and pullover pairing sounds great! love, love love this!!! great colors and the shoes make me swoon!! Totally fab!! That hi-lo sweater is perfection. Even though I dissed purple in favor of teal, that is a beautiful color. Need to add something like that to my wardrobe soon. Purple is a very popular colour. Almost everybody likes purple! I like it too, but I am still a Pink Gal at heart. I had to go and get that sweater! I got black with the white stripe. It’s such a striking contrast…I’m going to try it first with grey pinstripe pants. Well, when the weather cools down (around November). I have to say I just discovered this blog and it is amazing! The photos of Angie’s outfits are so inspiring. And her advice is real life advice I can use to amp up my style. I’ve had so many epiphanies about why I’m bored with my clothes, feel weird in maxi dresses and uncomfortable about looking like I’m “trying”. Oh wow, Henley. That’s so fab! I’m excited about your black version of this pullover with the contrasting white back strip and zipper. And it’s great to have you on-board. Thanks for supporting YLF, and for the kind words. Angie, I’m getting use to the look of the exposed zipper as I am seeing more of them going into fall. I really think the reason I returned the sweater was because I had never seen a zipper exposed except the time in home economics (that dates me) a girl put her zipper in exposed on the outside and I helped her rip it out so she did not get a failing grade. I will likely own something with an exposed zipper, at least one thing before the fall/winter is over if for no other reason then I want to try the look and see if I do like it. Like eating, you never know if you like it or not until you actually try it.